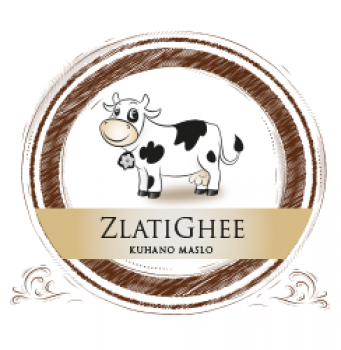 Careful and slow cooking (uninterrupted, 48-hour-long cooking over fire), together with raw material of free grazing cows, which all winter long live in accordance with Eco/Bio higher standards, result in the quality of Golden Ghee that we produce. The fullness of this essence, as Ghee can be called, is unique. 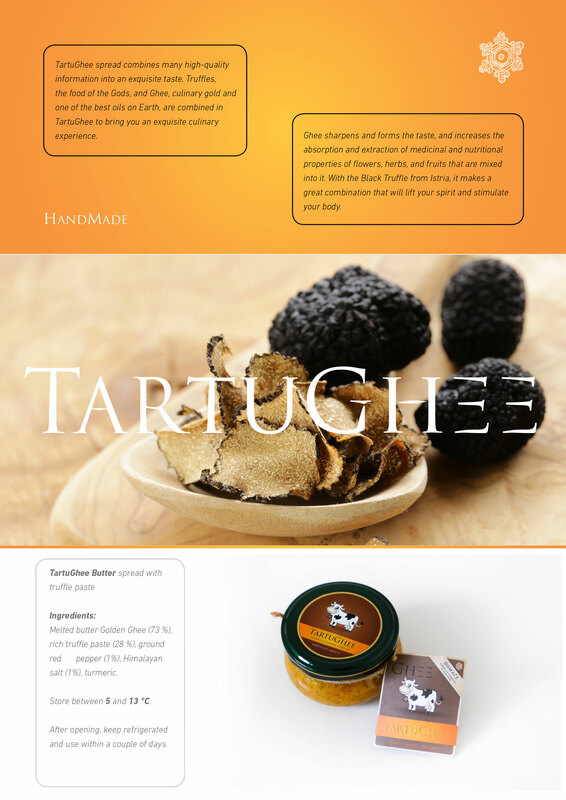 It revitalizes, and due to its smell and taste, places you into the category of a ‘healthy gourmet and alchemist’. In addition, expert opinions of Ayurvedic connoisseurs and medical doctors teach that it is highly recommendable and suitable for developing bodies, as well as a preventive. Fungi that cause candida are not in favour of the caprylic acid which Ghee contains. It is widely known that once the fungi in our system over-reproduce, weight loss is almost impossible. Candida causes fatigue, lack of concentration, recurring fungal infections, sinusitis, etc. The side effect that renders it impossible to lose weight is the constant want for sweets and carbon hydrates. This happens because fungi feed on sugar (carbon hydrates disintegrate into sugar in the digestive system) and stir in us the wish for food with which they could feed. 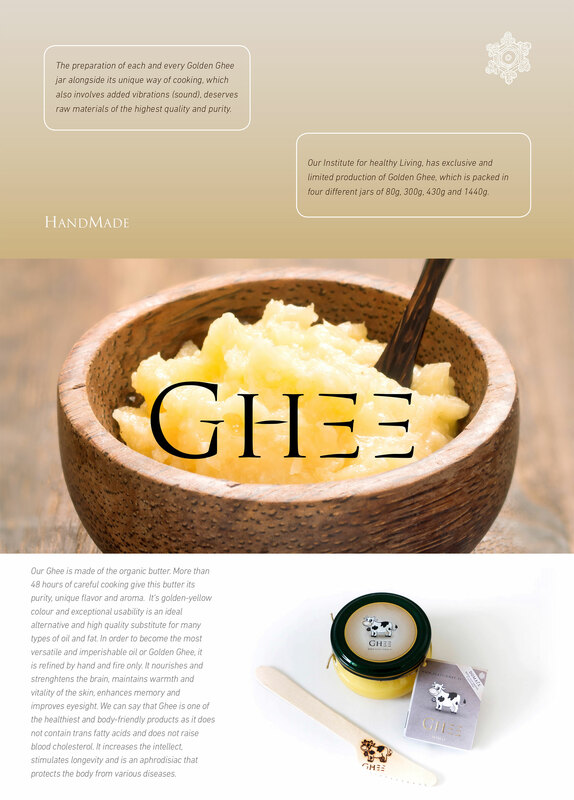 Find out why Ghee was dubbed ‘king’s therapy’, care and part of higher classes’ diet by flipping through the sites and links on our next page. Ghee (gi) also affects voice. Experts therefore recommended and prescribed it to those who use their voice for public purposes, for it is known to make the voice softer, more flexible and melodious. Ghee is among the first on the scale of the most used and wholesome fats. It is in sync with human physical biology, physiognomy, human energy and thus naturally close to our being. It literally blends with the human being and does not contain trans-fatty acids nor raise cholesterol levels. prohibits advertising and open writing about natural medicinal characteristics of food and such unless the effects are scientifically proven. Food business operators can thus, when tagging and advertising food and supplements, use only those scientific claims (222 defined) that are based on credible scientific evidence and were included in the list of permitted claims which were (or are yet to be) confirmed by the European Food Safety Authority (EFSA). ‘That is, however, only the first step toward care for health.’ This year, Codex Alimentarius, which will demote mostly manufacturers and salesmen of natural medicines, came into force. Ghee contains vitamins D, like the Sun, A, E and K. Without it, Ayurveda loses its therapeutic pillar, the trump card of this folk medicine. Ayurveda is a system of traditional medicine that originates from India but is practiced around the world as a complementary or alternative medicine. The word Ayurveda is in Sanskrit a compound of two words, ‘ayus’, meaning ‘life’ and ‘veda’, meaning ‘knowledge’ or ‘science’. Ayurveda, in translation ‘knowledge about life’, covers four aspects of man: soul, mind, feelings and body. It treats man holistically, teaches how to live in harmony with nature and helps live healthily. It covers all aspects of life as it encourages physical, intellectual, emotional and spiritual well-being. It explains how our thoughts, diet and lifestyle affect our physical state. It should be mentioned that Ghee does not contain casein, which is the main protein in the milk of ruminants and is difficult to digest. At the same time it is also addictive to some extent. For instance, casein rich cheeses are very tempting and indispensable to many (a lot of people are of the opinion that that is why so many like pizza). Gi easily penetrates cell membranes and therefore increases the efficiency of spices and herbs that are dissolved in it (it binds them onto itself). It also helps the absorption of not only vitamins and minerals, but also of phytonutrients (non-vitamin, non-mineral component of foods that have important characteristics and play a role in human well-being. There are thousands of them in our everyday food). 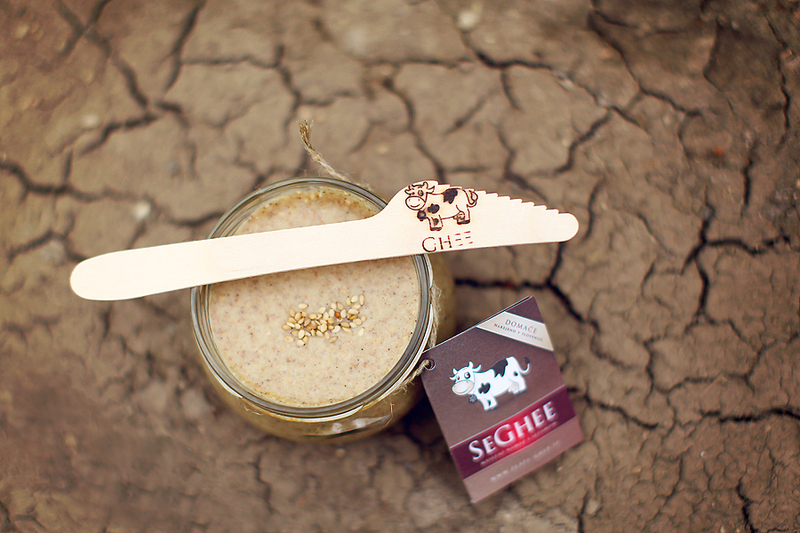 Ghee’s ability to penetrate depends largely on the way food is prepared and what kind of raw material it is made of. When cooked for a longer time, the structure of Ghee/butter becomes more delicate and thus accesses cell membranes more easily. 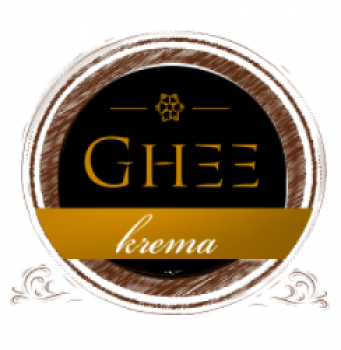 Ghee very efficiently draws toxins from the body and is thus indispensable in Panchakarma, Ayurvedic purifying process that lasts several days. It is also essential for those who do physical workout or exercises for energy as it lubricates joints and at the same time improves bodily elasticity. Many use it to anoint themselves from head to toe. In ancient times it was known as the only real means of anointment. It was prepared by soaking herbs and flowers into heated Ghee, which was then filtered and applied to skin. Skin has amazing absorbent abilities and therefore etheric, alkaloid and energy substances soaked into butter are wholly absorbed into the body within a few minutes. With the right mixture and some guidance, the person then undergoes transformations and is subject to different realizations and states. Achilles was supposedly anointed with Ghee by his mother. Ghee is also ideal for frying. Its smoking point (the point when the molecules begin to disintegrate) is high, up to 250˚C(482˚F), which is well above the usual baking temperature (180˚ – 200˚C or 392˚F) and thus above the smoking point of most of vegetable oils. It is important that the right and quality saturated fats are chosen (both can be found in gi, unsaturated as well), like the ones that Ghee contains. Word of advice: hydrogenated and highly processed oils and margarine are to be avoided since they are the cause behind inconveniences. Saturated fats have been the cornerstone of well-being for millennia; just think of our ancestor’s and previous generations’ diets. Ghee can be consumed whenever and in different forms: as butter, oil, a spread, cream basis and such. According to Ayurvedic doctors, however, it is most efficient when consumed in the morning onan empty stomach; 1 to 2 tea spoons. That is also the classic daily routine and secret to Tibetan longevity; mixing one or two spoons of it into warm tea. Ghee, being a fat, binds tea substances which, due to the function of the small intestinal mucosa, get into the blood stream and thus all over the body (that is why green and similar teas are served with butter biscuits). It is interesting, though, that Ghee is often considered an exotic ingredient from the Orient, when in fact we have been using it since ancient times under the simple name ‘butter’. ‘Puter’, for example, used to be today’s butter, the one that we buy in stores, wrapped in plastic, and known as raw butter. 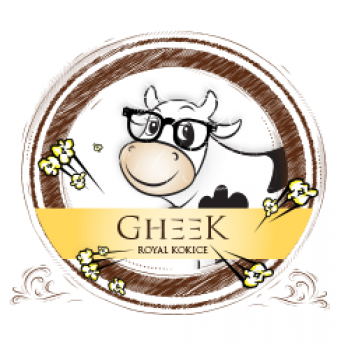 Ghee or maslo’ (butter in English), as it was called in Old Slavonic language, is a milk distillate. Natural Ghee (made from the right raw material) is an antioxidant and contains high density lipoprotein or HDL, known also as the ‘good cholesterol’. It carries LDL or bad cholesterol from tissues and arteries into liver which then removes it from the body in the form of gall. Higher levels of HDL cholesterol in the blood prevent exposure to cardiovascular and coronary problems (it inhibits the formation of cholesterol tissue in veins). The good cholesterol is also the basis of our hormones (cortisol, serotonin, histamine, melatonin, etc.) which are released into the blood by important endocrine glands, and on which our whole well-being depends (physical and on energy levels). Contrary to HDL, there is also LDL (low density cholesterol), known as the ‘bad cholesterol’. Natural Ghee does not contain it, however, it can be found in full fat dairy products, egg yolk, meat, classical butter, suet, margarine, ointments with oil and fat, etc. And all of the above speed up the process of atherosclerosis which is one of the main risk factors for heart attack and stroke occurrence. The ‘good cholesterol’ levels depend on the nourishment of cows and the environment that they live in. 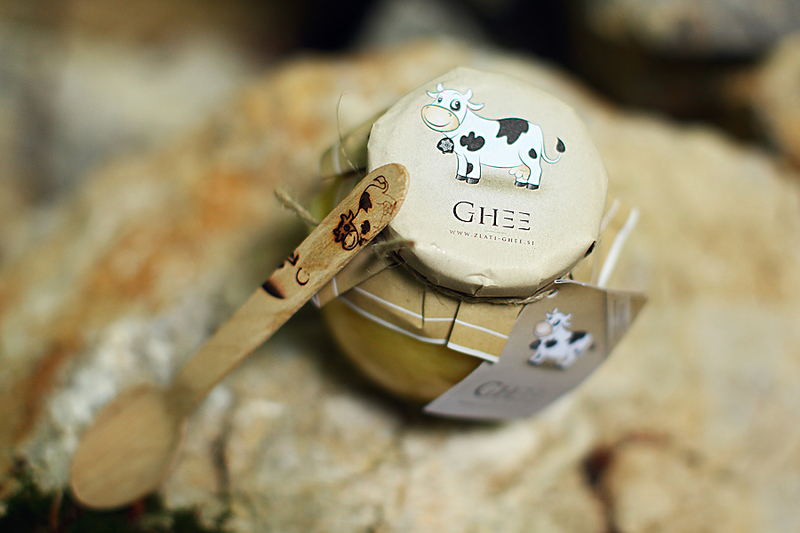 Ghee does not contain lactose (sugar) and is therefore suitable also for those who are dairy product intolerant. People who are extremely intolerant and sensitive even to the slightest amounts of lactose are nevertheless warned against consumption of Ghee - your safety and well-being come first. 1. The results of a complete bacteriological analysis confirm purity and durability of Golden Ghee. Of all the fats, Ghee is the greatest flavour transmitter. A tiny spoon of it suffices to improve the taste, intensify it and create a fine aroma and wholeness. Many describe it as the most universal oil on Earth. goes well with side-dishes such as ‘mlinci’ (pasta tatters made from thin dried dough), rice, mashed potatoes (yum), pasta, etc. when stored properly it does not have an expiration date and gets even better over the years. After 50 years of proper storage it supposedly heals all worldly illnesses (written in one of the verses of the old Ayurvedic book). In India, known doctors of this medicine keep in their cases of concoctions and potions up to 300 years old ghi, the price of which is, for common people, astronomical. 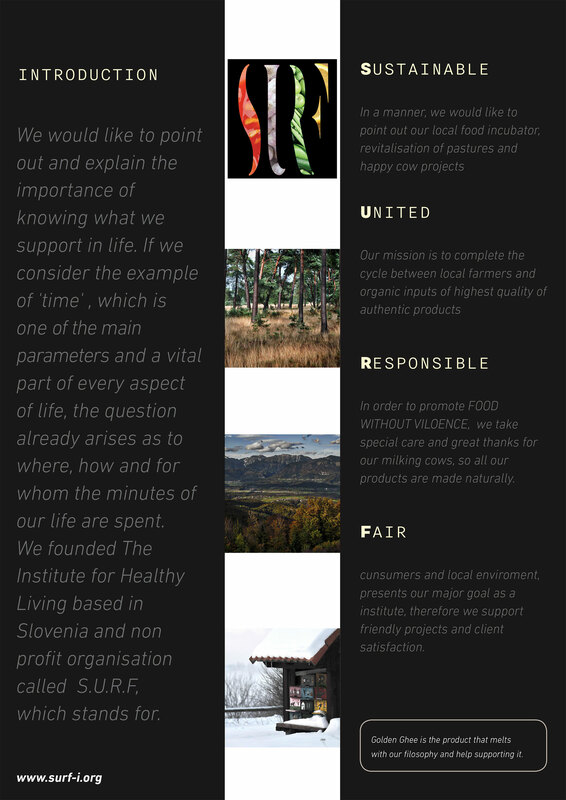 We always like to point out and explain the importance of knowing what we support in life. If we consider the example of ‘time’, which is one of the main parameters and a vital part of every aspect of life, the question already arises as to where, how and for whom the minutes of our lives are spent. 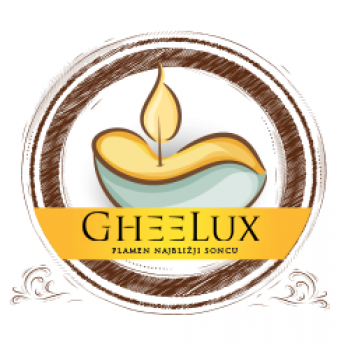 Golden Ghee is made of raw materials that are of the highest quality, authentic and wholesome, and we are determined to invest our time, energy, thoughts and money into obtaining them. 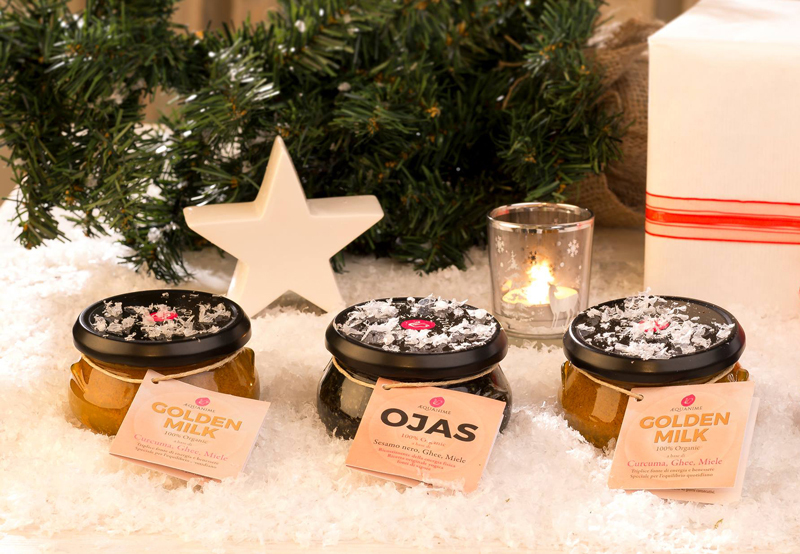 The preparation of each and every Golden Ghee jar alongside its unique way of cooking, which also involves added vibrations (like sound), deserves raw materials (milk) of the highest quality and purity. 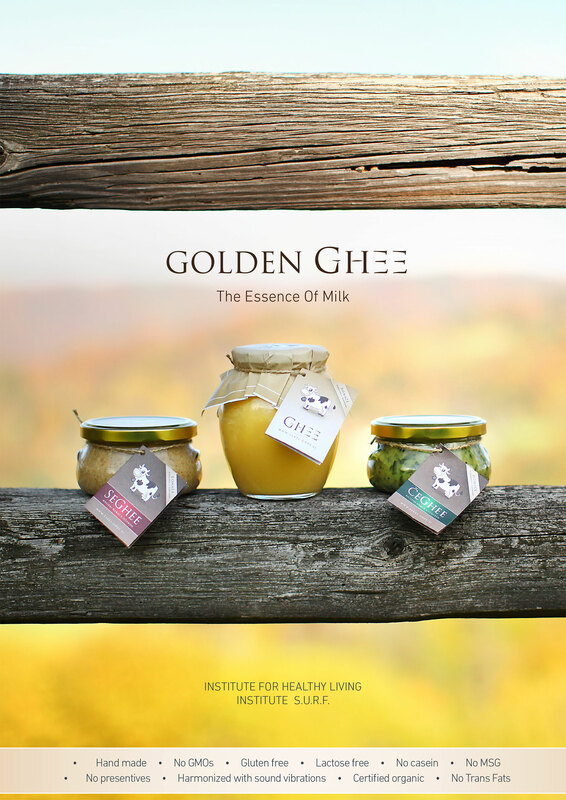 The milk which serves as the basis of Golden Ghee originates from regions where commitment to the best possible life-style and animal well-being has been practiced for more than 4 decades. There, the same as here, the responsibility to livestock begins with the worms in the soil. During the sunny period the cows graze on hilly, mountainous and flat pastures. Their habitat is full of colourful flowers and herbs, the water is clean and live, and the air fresh. All elements are combined. They are represented by: gentle sun, fresh wind, clear water, rich soil, abundant grass, different herbs and flowers and a unique animal that unifies it all. In reality eco famers, owners of milking cows, favour food quality to maximum animal efficiency. 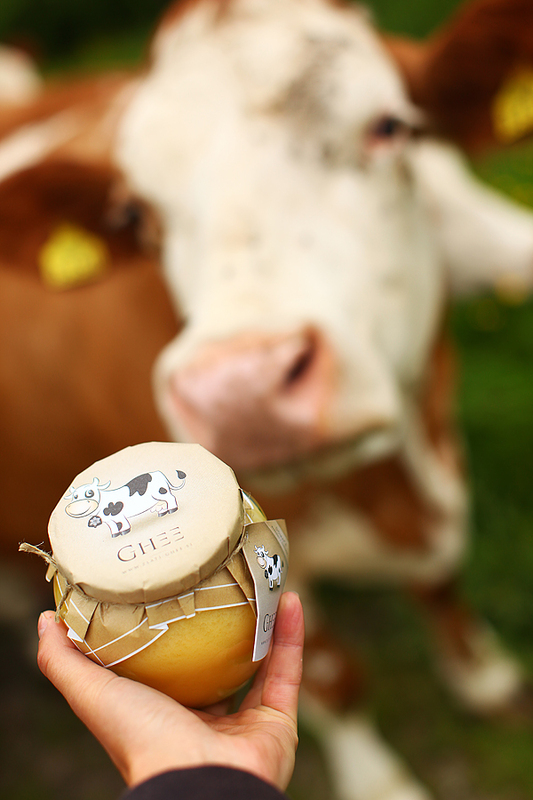 The cows which give the raw material that Golden Ghee butter is made of give in average up to 25% less milk than conventional ones. Farmers strive toward maintaining high quality diet of cows also during the winter. Plant growth, demand-stimulation in the surrounding areas, rich forage grass, clover, corn, cereal, lupine, beans, peas, soya, sugar beet and other not genetically modified foods, as well as expeller and mineral compound creation are farmers’ concerns all year round. Homely and familial regime also governs the lives of calves, for they are kept at their mothers’ side for a long time. Well-being is thus the key to healthy immune system of the animal. Throughout the warm season the cows graze freely (living food), while during the winter they have access to specially made yards with suitable oases and training grounds. 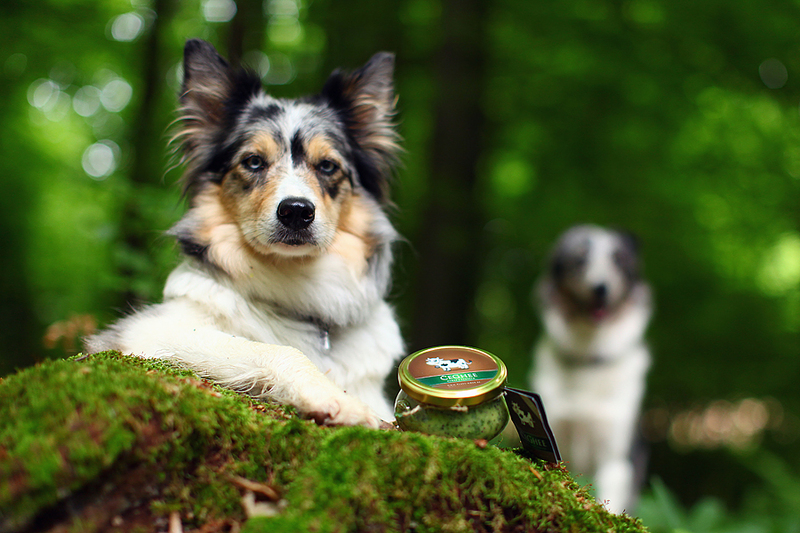 When animals are in need of medical assistance, homeopathy and acupuncture are first in line. Cow tethering in stables is not practiced and the animals always have dry and clean litter made from natural materials such as straw and other. The butter is cooked according to an old recipe. 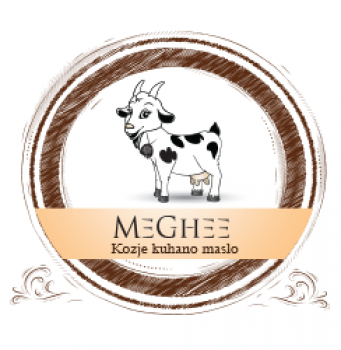 ‘Žonta’, ‘masunek’, rendered butter, cooked butter or just ‘maslo’ (Old Slavonic term for ghi) cooked by us has a special flavour that is recognized by anyone who has ever had the chance to taste different ghis. The characteristic that we like to point out is the approximately 48-hour-long, carefuland sound vibration enhanced cooking* which is finished after 2 days. The substance is then left to slowly cool off and poured into glass jars. This is followed by the second stage of cooling and then packaging on a special good vibes table . The final part that follows is letting it rest in darkness and peace. The manufacture of Golden Ghee is thus almost complete. Wise men and masters of different skills from Himalayan regions have and still are teaching that consumption and universal use of quality ghi make life easier. We are eager to mention that the right ghi improves growth in all aspects and energy levels of existence. The meaning of ‘sound vibration enhanced cooking’: for the duration of cooking (48 hours and more) each pot is exposed to sounds of nature coming from a state-of-the art HiFi. Once the pots are cooked, vibrations from musical instruments are directed towards them, imprinting vibrations of harmony on the molecules and consequently atoms of Golden Ghee. At room temperature Ghee is of light yellow colour, whereas it is golden when in liquid state. (The quality of cooked butters is measured also in colour.) Depending on the temperature of its environment, the viscosity of Ghee can be compared to that of honey (Ghee also behaves similarly). It can thus be easily spread and eaten with a spoon. At low temperatures, Ghee naturally crystallizes (like honey, it changes the colour all the way to shades of white).At temperatures above 22 yet below 24˚C, it starts liquefying at the top of the jar. At 35˚C it is as liquid as the olive oil itself. When taking Ghee out of the jar it is vital that only one tool per meal is used. Due to filth and other crumbsinput, as well as slow usage, it can spoil (vapour, moisture, unclean spoons, dust, substantialthermal fluctuation, etc. affect the shelf life of Ghee outside the fridge). A jar of correctly prepared and originally packed Ghee is, when stored in darkness and at the right temperature, almost life-lasting. If we want to preserve ‘the essence of nature’, as we like to call Golden Ghee, it should be kept away from electrical appliances. Thus the added vibrations and energy of our careful preparation are conserved. When stored in refrigerator, Ghee solidifies similarly to butter. The easiest way to store it is in a cupboard or a drawer, while the safest is in a fridge. Once in the refrigerator, it is almost imperishable even when used constantly and less carefully (word of advice: when used daily or at least every three days, it can easily be kept at room temperature). When stored correctly, Ghee does not need to be kept in refrigerator. At room temperature it lasts for months if not more as it does not contain substances that turn rancid. 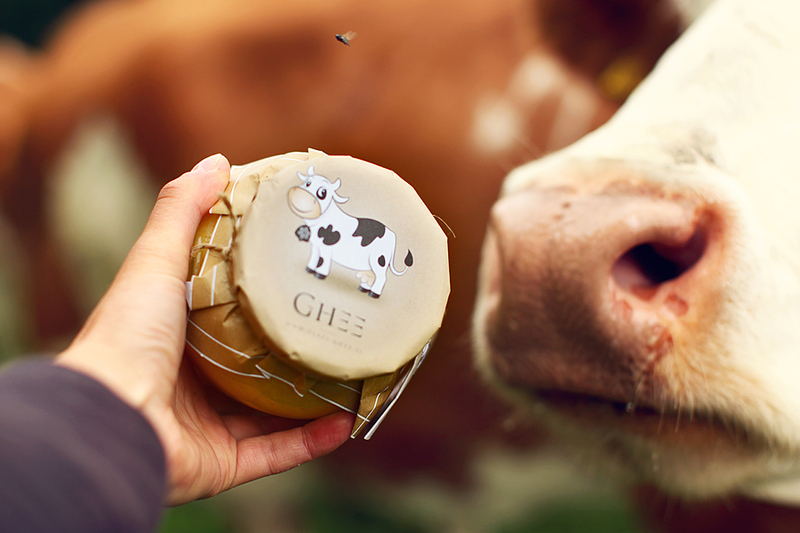 Ghee is a natural preservative and can therefore be spread onto cheese and other foods that otherwise easily react with mould. Over years Ghee changes its taste, colour and smell. 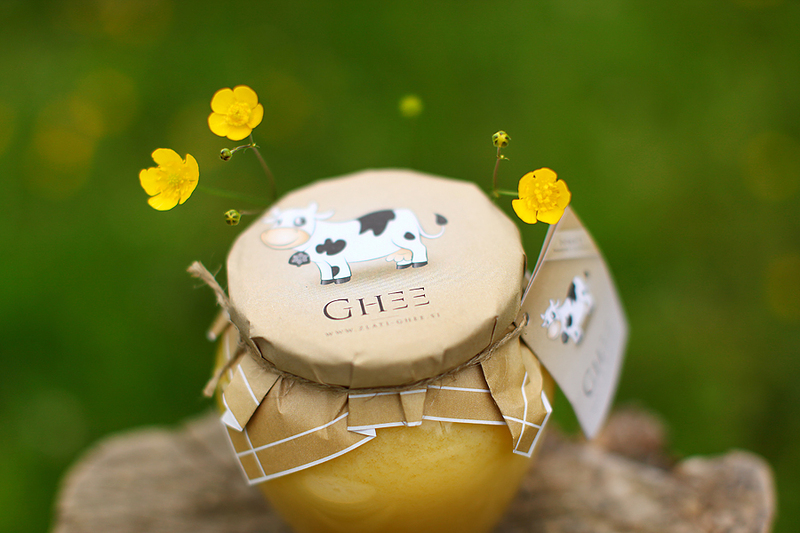 Ghee is culinary gold – excellent for preparing and cooking all kinds of dishes. Ghee is an excellent substitute for raw butter andmany oils, as it is extremely refreshing and can be used in a hundred and one ways. Excellent for baking and frying (up to 240˚C), roasting, etc. as it deepens and intensifies the taste of the dish. Add Ghee to side-dishes such as ‘mlinci’ (pasta tatters made from thin dried dough), rice, mashed potatoes, pasta, etc. Use it to roast spices and herbs. Vegetables of plain taste such as zucchini, button mushrooms and the likes, stir-fry in Ghee, put on a plate and add salt. You will be surprised. Spread it on bread, with or without marmalade, other spreads, honey or make your own delicious spread. Try and you’ll see that a better and more useful ingredient for spread making could hardly be found. At room temperature does not spoil when stored correctly. Has higher smoking point than many other oils (up to 250˚C). It can be reused when used for cooking. It is confirmed that after roasting button mushrooms, zucchini and such, all that needs to be done is strain it and save it for the next time. We do it up to four times! Ghi can be added to already made dishes, side-dishes, soups and sauces. As the essence of milk it can substitute all other dairy products. We do, however, encourage that you use different quality oils, thus consuming the needed elements and strengthening the body on different levels. It is great as a cream production basis as it efficiently absorbs and transmits herb and flower traits. It is a medium that transfers the essence and physical properties of flowers into skin and all the way to the small intestinal mucosa when consumed orally.It then transforms the above mentioned for the most efficient transmission by blood all over the body. Mixed with warm milk and herbs it is an excellent beverage for nerve soothing and digestion. Before sleep drink any tea (balm, for example), add two tea-spoons of Ghee, two tea-spoons of honey and mix it. A drop of Ghee should be put into eyes once a week. Melt is so that it is liquid, then put it in like you would a contact lens; put it on your finger pad, widen your eye with your other hand and wait for the drop to fall in. Close the eye and rotate it in all directions. The Ghee eye exercise is especially appropriate two hours before sleep. It is particularly appropriate for oil lamps as it cleans and balances space when in form of a flame, just the same as it cleans the body through the eyes. 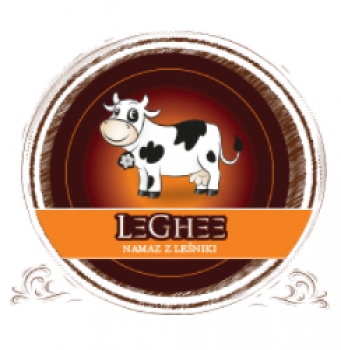 Read more under Ghee Lampa tab. When stored properly Ghee is imperishable. Although it loses some of its delicious taste over years, it also gains a lot of medicinal quality. Ghee is definitely the most universally used oil on the planet. Just a little bit of Ghee can enrich a plain lunch. If looking to reduce fats, try adding ghee to roasted or cooked vegetables or roast them in ghee. A few drops of ghee and freshly chopped herbs give excellent taste and can be added to simple, undressed vegetable soups, rice, pasta or legume. Your imagination is the only one that can limit the wide applicability of Ghee. Like all oils, Ghee is high in calories and thus used moderately (when used daily 5-6 tea-spoons per day). Mushrooms roasted in Ghee. Add salt when already on the plate. Zucchini roasted in Ghee, 3 minutes each side. Add salt when already on the plate. Aubergine roasted in Ghee, 5 minutes each side. Add salt to a slice of bread, put on hot aubergine and a thin slice of cheese, and make a sandwich. Sunny-side up eggs in Ghee. The original ‘wiener schnitzel’ is always made in Ghee, as old Vienna cooking schools have always taught. Put Ghee in cake batter, yet 30% less than raw butter. The dough will be delicate, soft, smooth and fresh longer. 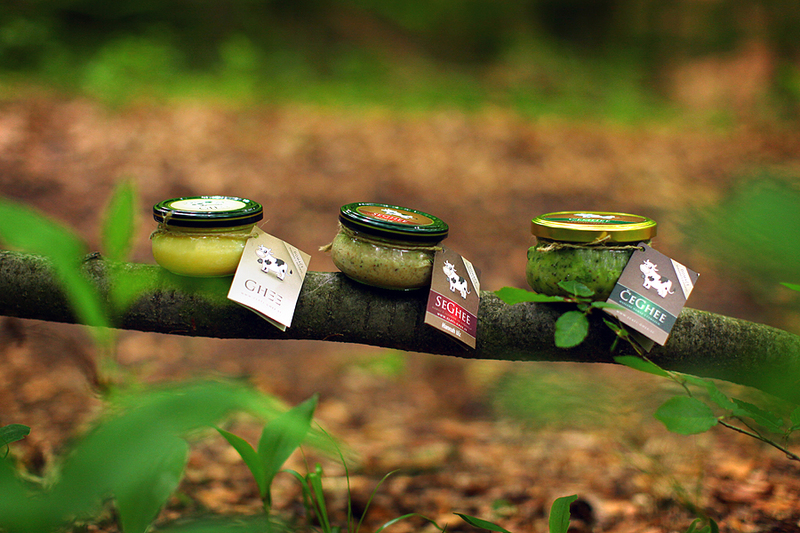 Ghee is a spread. Roast sunflower seeds and add salt in the meantime. Grind them after they have cooled off and add room-temperature warm Ghee. Mix uninterruptedly and create your own texture. Ghee in herbal teas. It binds herbal ingredients and as an agent and with the help of the small intestines carries it all over the body. Fish roasted in Ghee. Coat the fish on the inside as well, then add chopped garlic and parsley. …… the following tip can only be limited by your mind! Hello! I have to tell you that you make extremely tasteful butter! I was positively surprised, as it is great for cooking and has delicious taste and smell! I especially like it spread on a tasty slice of bread. I am really glad that Miro brought it. I wish you lots of success and great ideas when creating! 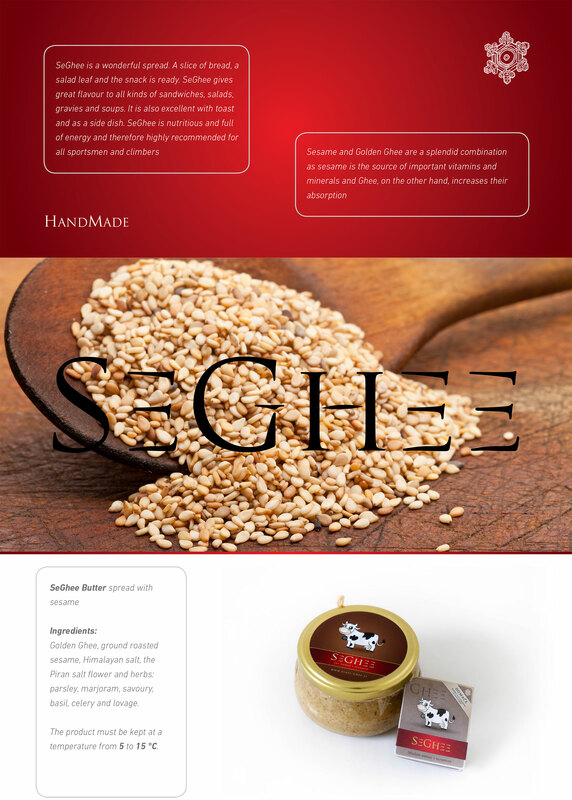 Your sesame Ghee (SeGhee) is made for Gods, heavenly nectar. Divine, I lack words. This butter is also face-friendly. I know somebody who only uses this butter because other creams – even the most expensive one – do not suit her, she gets an allergic reaction. Since shehas started using this butter she has baby skin. They used to roast ‘šnite’ (slices) in this butter and there always had to be enough to ‘oil the belly button’ of the baby. Hello. I am very satisfied with your Ghee and love using it, as it is, although healthy, also very very tasty. If possible I would like to order 5 large jars, for I want to spread joy among others for this New Year. This cooked butter tastes just like my grandmother’s. Go guys, your Ghee is fantastic, a necessary equipment in my protocols for hormonal balance, problematic skin and auto-immune diseases. Keep going. I have to sing praises to Vlasta from Koper who supplies me with it. I am reading the book ‘Ayurvedic cooking for self-healing’ and have read an interesting fact: honey and Ghee are incompatible (although yummy when eaten together) but only when consumed in equal amounts (Ghee is a coolant and honey a heating agent). If they are mixed and consumed in 2:1 ration they are not toxic and do not harm the body. The reason?Prabhav – an inexplicable effect on the body. Different amounts of Ghee and honey must therefore be consumed (for example one tea-spoon of honey and three tea-spoons of Ghee). It can thus still be a delicious combination, in the right ration, of course. 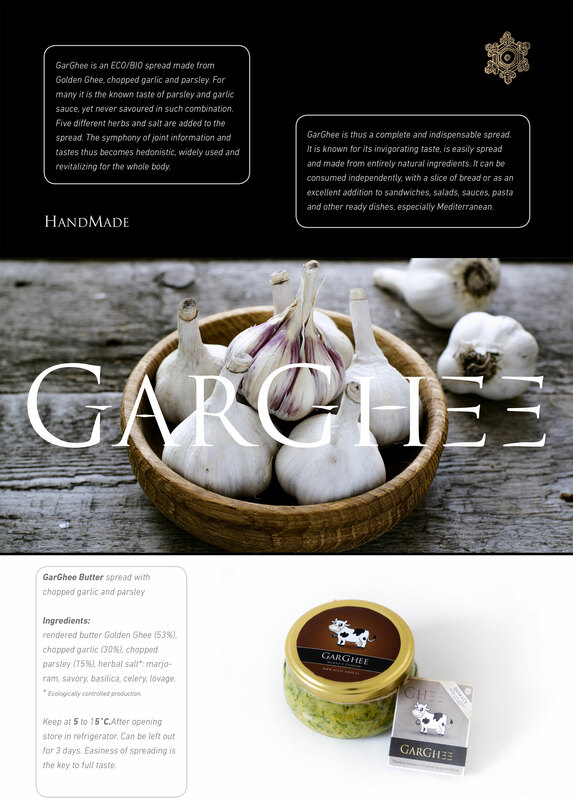 Thank you everyone, dear gourmets, naturalists and universal users of Ghee. With your choice you express your appreciation of the precious time that we put into the meticulous, slow and enriched cooking of Ghee, which some of you and us call ‘Golden Fatty’. According to Ayurveda, Ghee is appropriate for all types of people as it soothes all three doshas (vata, pittha and kapha). Above all, it strengthens agni or digestive fire. Ayurveda recommends ghee in combination with spices. Spices are roasted in it and other foods added, or we can cook the dish and finally mix in ghee-roasted herbs. Dishes prepared in such a manner, whether vegetable or rice, legume, cereals, etc. are jewels of Ayurvedic and healthy vegetarian cuisine, and that of other diets. IMPROVES ABSORPTION: Ghee is an integral part of Ayurvedic medicine. As it is fundamentally oil, it easily binds the nutritional substances in plants which meltin fat. It thus penetrates cell membranes which are based on lipids. According to some observations, Ghee enhances the efficacy of nutritional substances inplants by serving as a carrier of active components into the interior of cells where they are of most use and effect. DIGESTION: according to Ayurveda, Ghee helps balancing the surplus of gastric acid as well as maintaining natural stability and viscosity of stomach walls and intestines. Intestinal imbalances as the world knows them supposedly cannot occur if one consumes Ghee. BURN RELIEVER: similarly to Aloe Vera, Ghee lessens development of blisters and scars in so far as it is applied on burnt or damaged skin quickly enough. Aged Ghee has greater medicinal value. Many records state that Ghee that has been carefully buried in the ground (one of the ways) for 50 years works wonders. We have been aging it for a few years now. The plan is to build the first butyric cellar in the world. - In books of ancient arts, thousands of years old, Ghee is mentioned and named ‘king’s therapy’. According to Ayurveda, lips crack and burn when the weather is cold and vatadosha is enhanced. The condition is neutralized by applying purified butter or Ghee (herbs and flowers can be added) onto lips. The lips are then massaged and left to rest overnight. Ghee is fantastic when used as body vaseline, lubricant, ointment or cream basis. We produce ointment/cream with high St John’s wort content. Also added are lavender, honey, a pinch of sage and foxtail grass – herb. 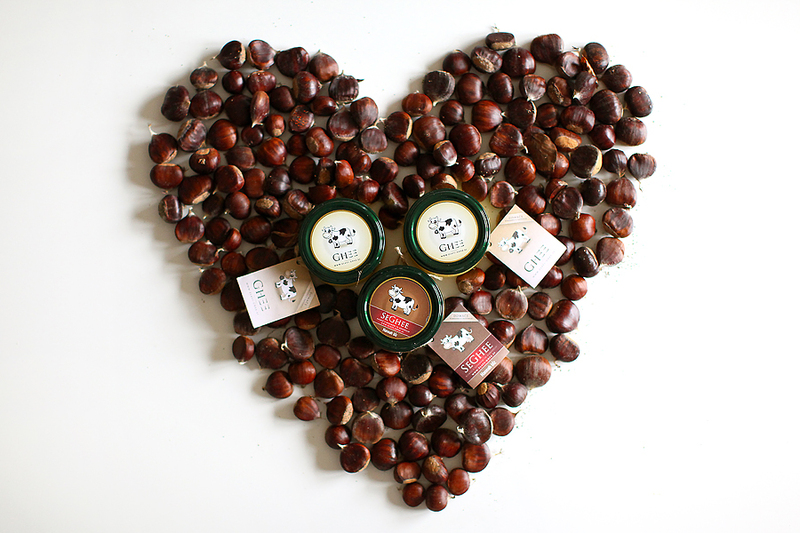 The crafted ointment is suitable for skin, joints and a lot more, including massage. After just over an hour the body is thoroughly rinsed and wiped. A new cream is also in the phase of development. 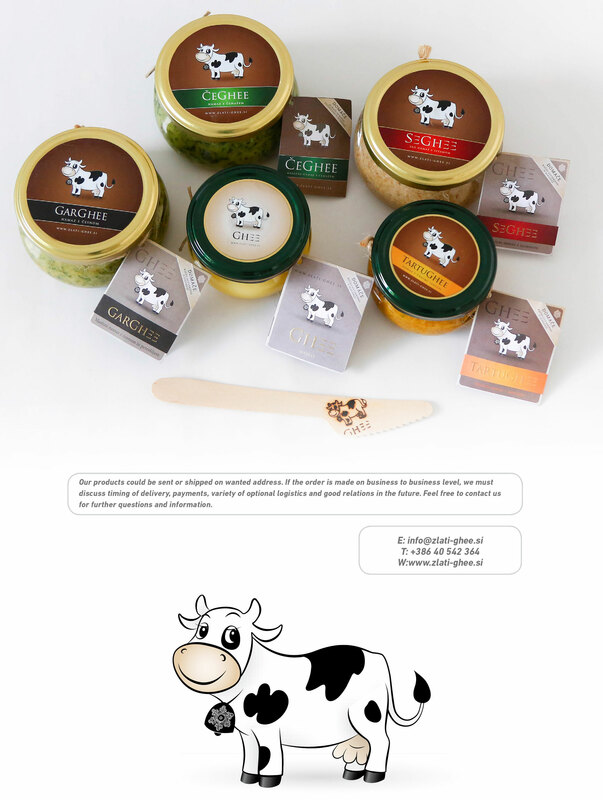 It is completely natural, without preservatives and will stay fresh for up to 3 months. Its purpose is to refresh as well as provide nutrition for the skin. It is widely known that Ghee absorbs traits of soaked plants, thus creating an exceptional combination. Creams can therefore easily be produced in your own kitchen. Example: St John’s wort is an extraordinary plant by itself. Combined with Ghee, it penetrates all the way to the bone marrow. With regular massage it effectively restores the flexibility of the skeleton and strengthens it. ŠrilaPrabhubada’s books describe that by consuming Ghee the fine brain cells which are needed to understand qualities and develop virtues are fed. Cow protection was very important in brahminical culture. In India, one can see cows strolling freely along the roads and resting beside them, without paying much attention to car noise, even to this day. The Indian people consider them holy animals and never harm them. 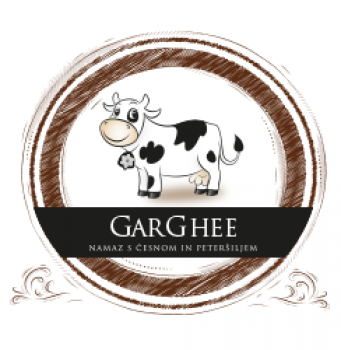 Ghi is the essence of milk, therefore the core and heart of this white liquid which is produced by the really special animal, ‘the mother cow’. Just imagine what a cow means to a family living in Russian, Mongolian or Indian steppes! Homely and familial regime also governs the lives of the calves for they are kept at their mothers’ side for a long time. Well-being is thus the key to healthy immune system of the animal. 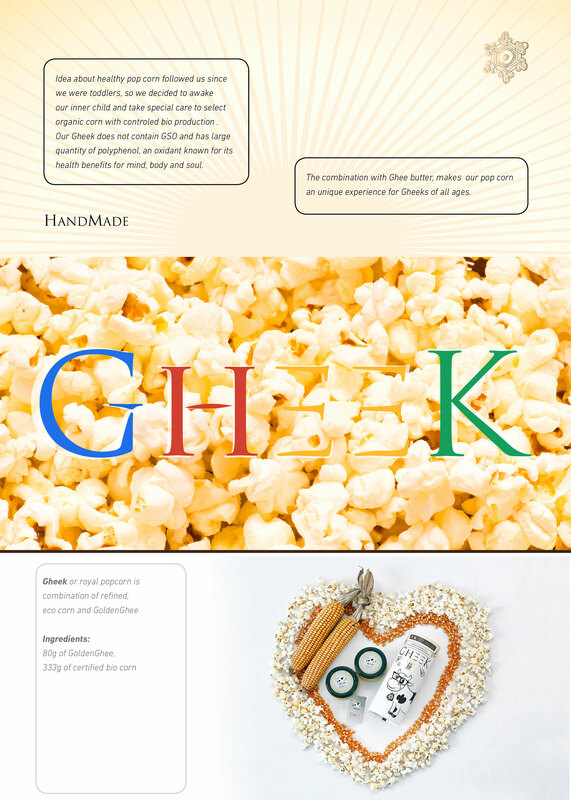 It is important to distinguish between ghis that are bought in England, India, in stores, etc. These can be of lighter colour, almost white. Especially India is known for its Ghee made from buffalo milk or milk fat. Buffaloes are a lot less picky when it comes to food than cows are, the difference is, however, easily observed in terms of colour, smell and taste ofGhee itself. 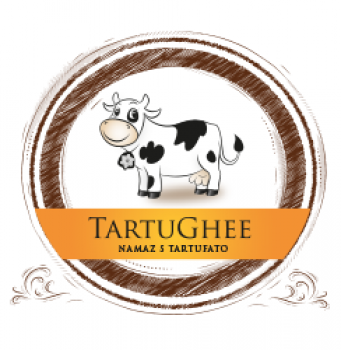 Alongside integrity and quality of milk, the crucial role is played by the energy on and with which ghee is cooked, the required time, careful procedure, warmth of the environment, handling, ways of packaging, storage, knowledge, skills, etc. "Ghee is live nectar that combines SUN rays, WATER drops, EARTH minerals, GRASS prana, COW dedication., and HUMAN will"
100 % natural and handmade Deo-stick.